Onychomycosis is a nail infection caused by fungus–Trichophyton rubrum. Currently, around 2-3% of the U.S. population are suffering from onynchomycosis. Onychomycosis is majorly four types which include distal subungual onychomycosis, proximal subungual onychomycosis, and white superficial onychomycosis and candida infections of the nail. Globally, increased prevalence rate of diabetic patients and geriatric population, consistent raise in the prevalence of onychomycosis infections, rise in awareness among common people regarding diagnosis and treatment of Onychomycosis, and development of novel medications are the prime growth drivers of Onychomycosis market. 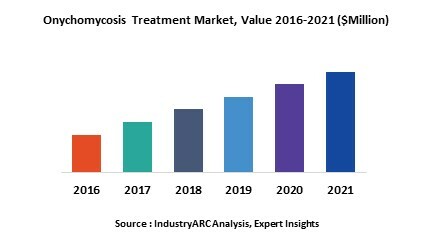 In addition, emerging economies such as China, India and others, will create new opportunities for global Onychomycosis market. However, Increased circulation of off label products and Negligence towards this infection especially in less developed economies are the key restraints for global Onychomycosis treatment market. Geographically, Asia-Pacific is considered as an emerging market due to growing market penetration in this region. Increasing disposable income among population is also accounted for the Onychomycosis Treatment market growth in Asia-Pacific countries. Rest of the world (RoW) holds fourth position in the global Onychomycosis Treatment market due to poor economic and health condition in most of the African countries. RoW market growth will be fuelled by extensive increase in healthcare infrastructure in Brazil and Mexico. This report identifies the onychomycosis treatment market size in for the year 2016-2021, and forecast of the same for year 2021. It also highlights the potential growth opportunities in the coming years, while also reviewing the market drivers, restraints, growth indicators, challenges, market dynamics, competitive landscape, and other key aspects with respect to onychomycosis treatment market. This report has been further segmented into major regions, which includes detailed analysis of each region such as North America, Europe, Asia-Pacific (APAC) and Rest of the World (RoW) covering all the major country level markets for Onychomycosis Treatment in each of the region.